Six years after Indonesia passed a forest moratorium aimed at slowing unsustainable agricultural expansion into primary forests and peatlands, tree cover loss remains high, according to the latest satellite data from the University of Maryland and Google, available now on Global Forest Watch. The 2015 tree cover loss data from the Global Land Analysis & Discovery (GLAD) lab at the University of Maryland — the most recent annual global data available — show tree cover loss in Indonesia remained high between 2001 and 2015, though that doesn’t fully reflect the devastation of forest and peatland fires in late 2015. Tree cover loss refers to the loss of any trees, regardless of cause or type, from tropical rainforest to tree plantation. For this analysis, we calculated tree cover loss within Indonesia’s primary forest data, which shows intact and degraded natural forests of five hectares (12 acres) or more. 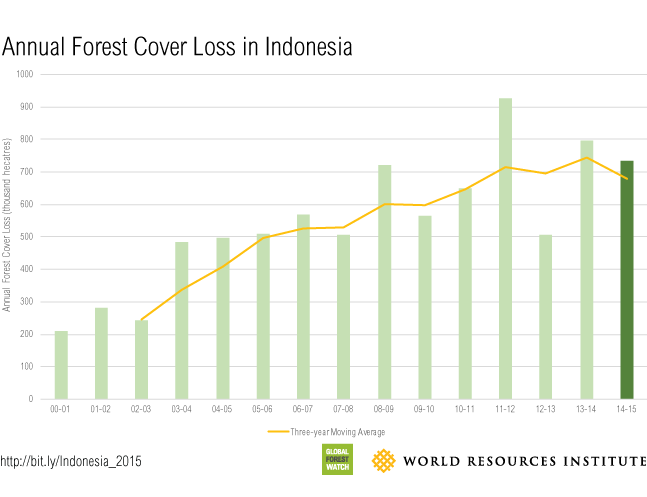 Forest cover loss in Indonesia peaked in 2012 at 928,000 hectares (2.3 million acres), dropped significantly in 2013 and then increased in 2014 and 2015 to 796,500 hectares (2 million acres) and 735,000 hectares (2.8 million acres), respectively. Here’s a look at the trend between 2001 and 2015. Kalimantan: Almost half the national forest loss in 2015 occured in Kalimantan, reaching 323,000 hectares (798,000 acres). Massive expansion of oil palm plantations into forests starting in 2005 may well have been a factor. Sumatra: Forest loss in Sumatra dropped significantly from 2014 to 2015, but that because there are no more accessible primary forests to cut. The map below shows that the remaining 321,000 hectares of primary forest in Sumatra are located along steep slope, mountainous forest regions along Bukit Barisan that are difficult to reach. Papua: Forest conservation efforts should be focused in Papua Island, home to about a third of Indonesia’s remaining rainforests, which provide habitats for biodiversity and livelihoods for villagers. 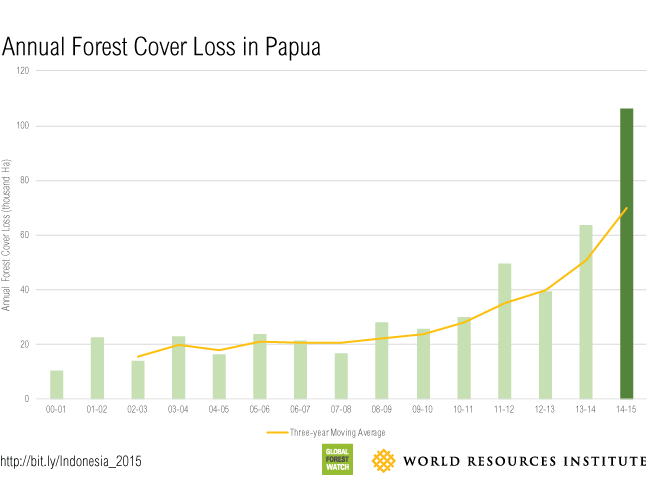 Forest cover loss increased in Papua and West Papua provinces; 2015 showed the highest forest cover loss since 2001. Deforestation has been largely driven by industrial agriculture, plantations and logging often within primary forests and carbon-rich peatlands. Data from Greenpeace Indonesia show that 48 palm oil companies have permits in Papua and West Papua provinces, ranging from 25,000 to 45,000 hectares (62,000 to 111,000 acres) in size. The Indonesian Ministry of Environment and Forestry found that permits within forests in Papua have been granted since 2011 and some permits that mandate saving 20 percent of the area for local communities have been traded to businesses. Environment and Forestry Minister Siti Nurbaya Bakar reiterated that the government would prioritize the moratorium in these two provinces. Besides the damaging environmental impact of forest cover loss, forest encroachment also contributed to social conflicts, including violation of local community rights and land disputes. How Effective Is the Moratorium? Forest loss within moratorium areas continued to increase in 2015 in all areas except Sumatra, suggesting that the moratorium had scant effect on forest protection. Kalimantan recorded the highest forest loss within the moratorium area in 2015 (69,000 hectares or 170,000 acres), followed by Sumatra (39,000 hectares, or 96,000 acres) and Papua (25,000 hectares, or 62,000 acres). This could be because the moratorium is issued in the form of Presidential Instruction, which does not entail legal consequences for the perpetrators. With a decentralized political system in Indonesia, sub-national leaders can also issue local policies that may undermine the moratorium altogether. Despite Indonesia’s forest management commitments – such as moratorium policy, climate commitment laid out in the Nationally Determined Contribution and government regulations to protect peatland – much work needs to be done. Deforestation and land use change account for 47.7 percent of Indonesia’s greenhouse gas emissions. Tackling climate change in Indonesia – the world’s six-largest greenhouse gas emitter -- will require a systematic and structural effort to transform land management. Weak forest and land governance in Indonesia cause problems from over-exploitation of natural resources to social conflicts. One ways to improve governance is through President Joko Widodo’s One Map Policy, which calls for a synchronization of thematic maps from various sectors to include all key local stakeholders. To produce more effective policies to fight deforestation, further analysis needs to include forest timber harvesting data that can help track legal and illegal logging. To perform such analysis, the government should share logging concessions data with the public. On the law enforcement side, agencies need to strengthen monitoring to track the illegal logging and timber trade, while using available technologies to improve investigations of illegal logging. Implementing an effective and accountable Timber Legality Assurance System (SVLK) could help Indonesia intensify its fight against illegal, unreported and unregulated illegal logging and timber trade. Finally, public and civil society organizations can all be an informed citizens and voice concerns over increasing forest loss. Platforms like Global Forest Watch can monitor forest change in near real-time and advocate against forest encroachment. It is time to escalate efforts to protect tropical forests to decrease emissions and support the communities that depend on these landscapes for food, water, energy and health.